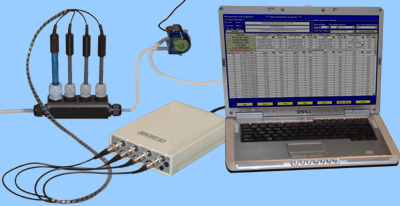 The system comes in an "easy to install" condition with 10 m inlet tubing, mains power adapter and 15 m data cable to the computer. Cable- and tubing-protection is also provided. For additional cable and tubing length, please contact us. In the cabin, where the computer is installed, two mains power outlets must be provided, one for the computer and one for a 24 V DC, 2 A Power Adaptor. The modular design Flow-through cell blocks can be joined to hold up to 12 electrodes or sensors. 1 x Flow-through Cell for 4 Sensors: pH, 2 x Ion, Temp. 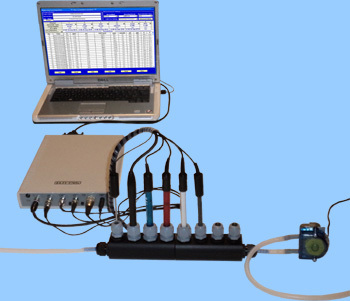 1 x Flow-through Cell for 4 Sensors: D.O., pH, ORP, Temp. 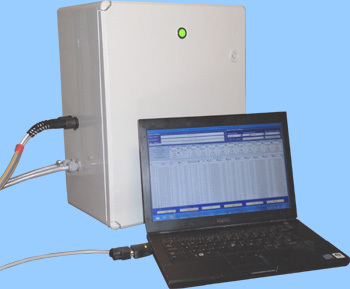 1 x Flow-through Cell for 4 Sensors: pH, ORP, Cond., Temp. 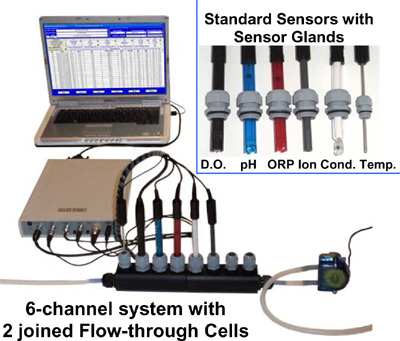 2 x Flow-through Cells for 6 Sensors: pH, ORP, 3 x Ion, Temp. 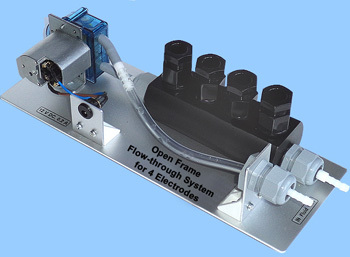 2 x Flow-through Cells for 6 Sensors: D.O., pH, ORP, Cond., 2 x Ion, Temp. 2 x Flow-through Cells for 8 Sensors: pH, ORP, 5 x Ion, Temp. 2 x Flow-through Cells for 8 Sensors: D.O., pH, ORP, Cond., 3 x Ion, Temp. 3 x Flow-through Cells for 12 Sensors: D.O., pH, ORP, Cond., 7 x Ion, Temp. For special configurations and arrangements please contact us.